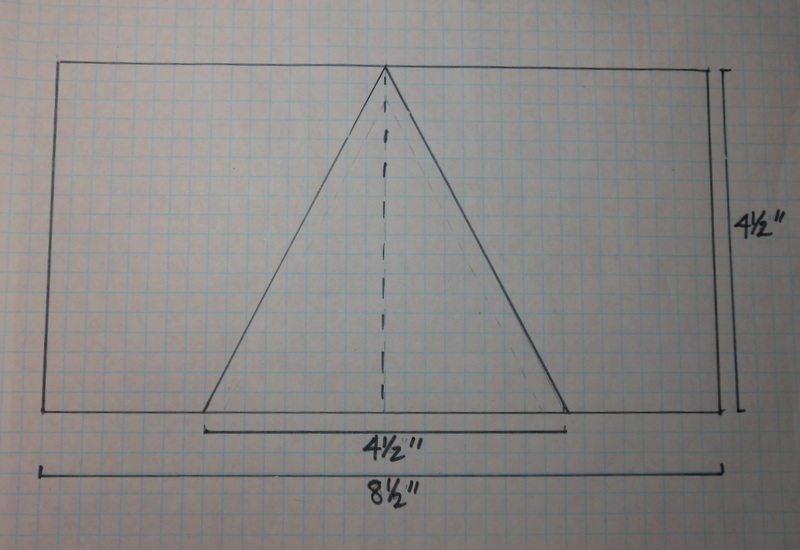 Foundation paper is 4 1/2" x 8 1/2"
Cut a template for your center triangle (I used cardboard). 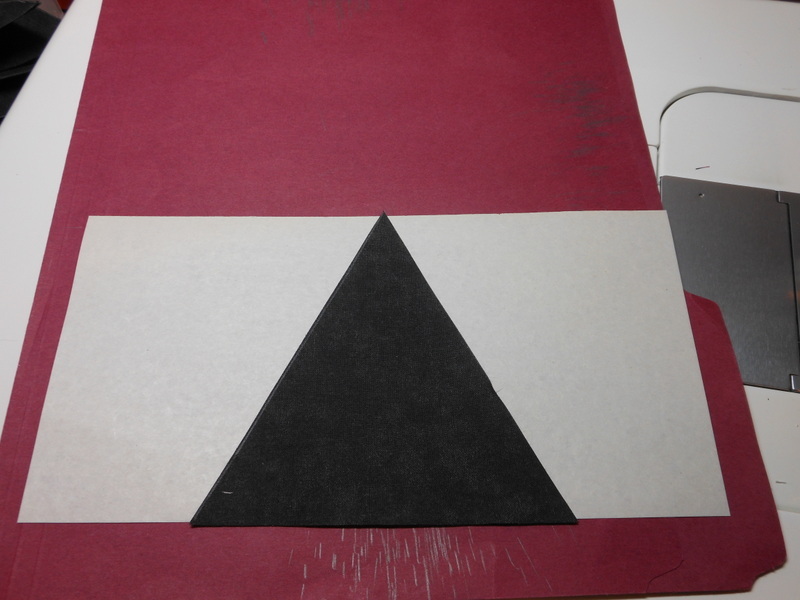 Trace the template and cut your fabric triangle. Center it on the foundation paper (I like to use a swipe of glue stick to keep it in place). Add a light string to the right side of the upward-facing triangle and a medium/dark string to the left side. I placed a light string on first in each block for consistency. Note: I like my triangle points to float a little, so I don't lose them--my triangle point allows for this. Continue until the paper is filled. All the blocks will have the same color orientation. Assemble in columns; this makes it easier to match up your triangles into diamonds. Note that the columns are offset--one begins with an upward-facing triangle, and the next with a downward facing one, etc. 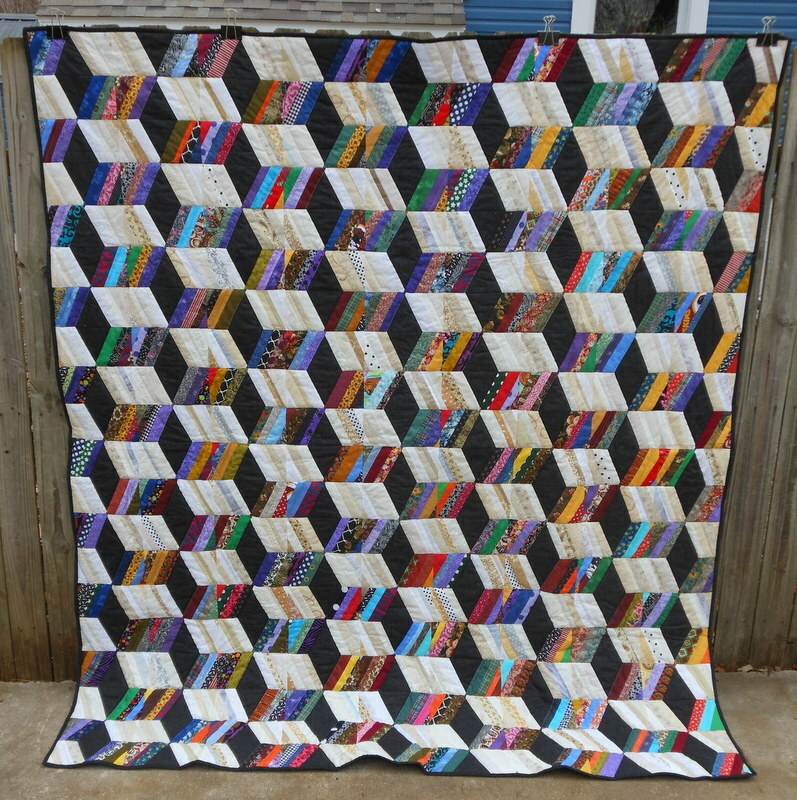 My quilt is 9 blocks wide and 20 blocks long. It finishes at 74" x 84". My strings were from 3/4" to 1 1/2" (approximately) wide. If you wanted to do this with wider strips, you might want to increase the size of the foundation and the template. Just keep the same ratios: the foundation should be twice as wide as it is tall (finished size) and the triangle base should be 1/2 the total width of the foundation paper (finished). Goody goody gumdrops! I have been waiting for you to post your tutorial! I will be wrangling some more scraps into blocks! Thankyou! Can you tell by the exclamation points that I am super excited? You are not alone Tartan! I have to make this. Or at least put it on the back burner till I can get it done. Thank you AngeliaNR . This is great! Thank you! Thank you! I am so impressed with your quilt. It's definitely on my to-do list. Thank you for your great tutorial! Your quilt turned out awesome and appreciate your generosity! You are welcome-- I am so flattered by the interest. Easy, isn't it? Thanks for the Boxes of Strings info. Put this one on my bucket list for sure. Thank you very much for taking the time to do this tutorial... it is such a different and original quilt! You've got smart brains!! Very neat and thanks for sharing. Every year, I try to have a different string quilt for spring church bazaar and this will work! Angelia, what a great tutorial and photos. Thank you for taking the time to post this...it looks like a fun project and a wonderful way to use up some scraps. Thanks. I will do this one next, just have to finish the one in process. I love this quilt. Thank you ever so much for this tutorial. 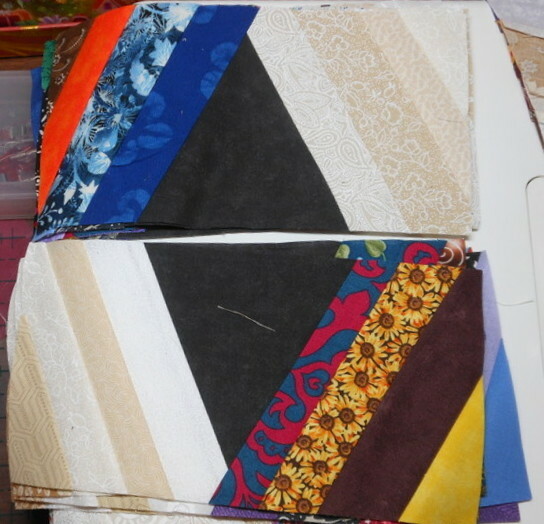 I have the strips in abundance and it will be refreshing to make a quilt with something other than.... 2.5 squares. Well, done! You can see many of us appreciate your effort to share your skill with us. Thank you so much for sharing! I think this is beautiful! Thank you for sharing! Your quilt is really beautiful! I prefer to use a plastic template to cut the triangle, but I'm not sure what angle it is...60 degrees?? Love your tutorial for your fantastic quilt! Like all the others, I am excited about it and your instructions are very clear. I don't think it is 60 degrees. The base and the height are equal unlike an equilateral triangle where all sides are equal. No math whiz here--help anyone? oh thank you. i was going to try to remember this quilt. Adding my thanks for the tut. Instructions are very clear and I loved your quilt. As I said before I love this quilt. Now I have a tutorial! Thank you very much for your great pictures and explanation. You are very talented And generous. What a wonderful combination! Thanks again!